I thought I’d take my first ATN section post and focus on something that everyone else is as well, the Lakers. I know, it’s not original. However, it seems many people outside of Laker land tend to think that this team will ultimately be ok. The thinking is that they are just taking the regular season off and simply don’t play with enough passion night in and night out in order to dominate the way they could/should. This thinking certainly has some merit to it. We’ve seen veteran teams struggle in the regular season before and then flip the switch in the playoffs. The Celtics did just that very thing last year. Now, I admit this could very well be the case, but I do see one glaring problem with the Lakers and that problem has a name: Ron Artest. We all know Ron wasn’t brought in to be an offensive force but instead to help guard the great small forwards of the league. However, he has been so inept on the offensive end this year that I believe he’s currently hurting the Lakers more than helping him. Let me show you. TS% (true shooting)- Artest ranks 3rd worst with a TS% of 46.9%. The closest starting SF for a contender to this number is Caron Butler, at 52%. Quite a large difference. EFG% (effective field goal)- The same problems arise here, where Artest is 4th worst in EFG% at 44.5%. Again, the closest starting SF for a contender is Caron Butler at distant 48.7%. 3P% (3-point)- I figured this would be the most favorable for Artest, considering this seems to be his primary role in the Lakers offense (whether Phil wants it to be or not). Again, he is the worst among the starting SFs playing for contenders at 33.8%. The closest to this number is LeBron at 36.2%. PER (player efficiency rating)- Again, Artest is near the bottom of the league for starting SFs with a PER of 11.21. Hedo is the closest to this number at 13.47. Total Rebound Rate- Finally, let’s look at his rebounding numbers. 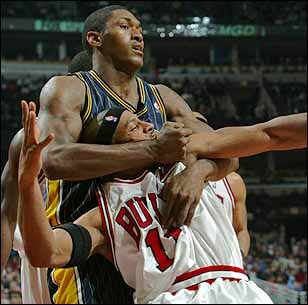 You’d think with Artest being so physical that he would be able to excel somewhat here. Well, you’d think wrong. His TRR is a dismal 6.3, 3rd worst among starting SFs in the leauge. Yet again his closest competitor when it comes to a starter for a contender is Caron Butler at a very distant 8.0. As you can see, Artest isn’t even playing like an average starting SF in this league right now (at least on offense), let alone one that is starting for a contender. He’s basically a dead spot currently for the Lakers on offense, and when you watch their games it is simply killing them. He gets a ton of open shots and will continue to do so untill he starts making a few. Ultimately, I think the Lakers have to think about making a move if he doesn’t start to improve. Whether that means making a trade or going to Matt Barnes more, I’m not sure. Artest simply isn’t the defender he once was to justify keeping him on the court while playing this poorly on the offensive end. Even if we are to admit that Artest doesn’t techinically “hurt” the Lakers (in terms of +/-) we have to also say that he isn’t playing well enough to be a starter for a team that wants to win a title. Finally, I could have done this same basic post about Derek Fisher. However considering how much Kobe loves Fisher there is virtually no chance of anything happening to his starting role. So, I figured it would be an excersize in futility to do such a thing. However, it means Artest’s struggles on offense have an even greater impact because the Lakers have another hole on offense at the PG spot. Hey Rich, I saw the link on cavstheblog.com and decided to sign up for this. Looks great so far. By the way, do you have a RCF account under the same name? Hey, I also saw the link on cavstheblog. Congrats on getting it started and I look forward to reading more! Hey Rich,im from Moscow and im gonna tell my friends about your blog,it is very good.I saw the link at cavs the blog too.